Maserati was purchased by Adolfo Orsi in 1937, and post-war the company suffered serious labour disputes resulting, in 1950, in the deaths of several protestors. In 1952 Orsi split the company up between his siblings. His sister, Ida Orsi, took charge of the company which made electronic components, Società Anonima Fabbrica Candele Accumulatori Maserati (FCAM). This part of the company had survived the war years in part by supplying the components required by the Maserati automobile plants to construct electric vehicles. Obviously a woman of some nous, Ida purchased the well-established Italmoto concern and rebranded their existing models as Maserati. Italmoto had a good sales network, with avenues into markets in Europe, North America and South Africa. In 1953 the first Maserati-designed motorcycles appeared on the market. The T2 was a single cylinder 123cc two-stroke with three-speed transmission, tubular frame, swing arm rear suspension and capable of 80 km/h. With the same frame, the company also produced the 160/T4 model, with a 158cc four-stroke engine and four-speed gearbox and capable of 95 km/h. In 1955, the T2 was fitted with telescopic front forks. Two more fourstrokes were the OHC 250 T4 capable of 120 km/h, and the 175cc S175 which was also quite fast. In 1956 they introduced 125 and 160cc two-strokes, which joined the existing 175 and 250cc fourstroke models. 50cc models also appeared, of which the sports 50/T2/S and 50/T2/SS were greatly admired by the younger riders, few of whom could afford them. They were extremely fast for the day, capable of 70 to 75 km/h. A British importer advertised "will reach 110 k.p.h. (approx 70 m.p.h. )", a claim perhaps a tad Trumpian. The story goes that another dealer, Gina Borri of Guido Borri in Modena, exclaimed when the first of the 50s arrived, "What is this ugly toad". It sold so well that before long they were applying toad stickers to the front guard of the 50/T23/SS, which became known as the Rospo (Toad). 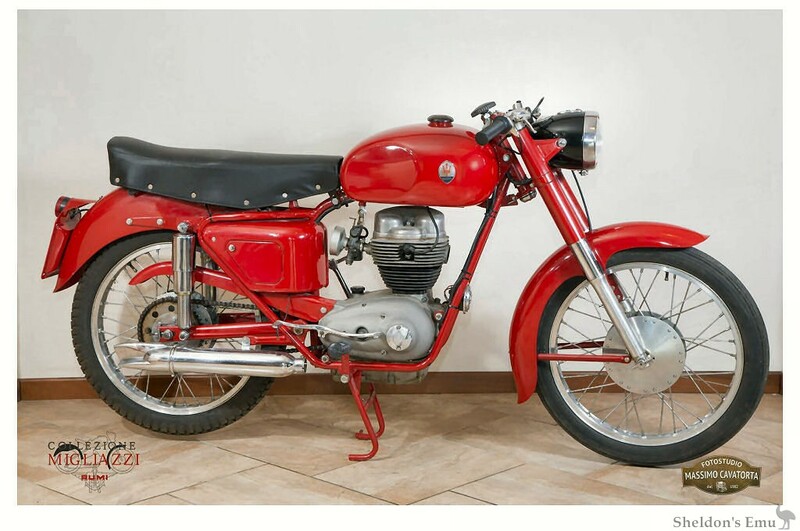 The motorcycle industry suffered badly in the late fifties due to the popularity of light, cheap cars like the Fiat Bambino, and Maserati struggled. Motorcycle production ceased in 1960. Notes: Frame was quite different to the Sports and Turismo 50cc models. This model was ridden in competition by Beryl Swain, famed as the first woman to compete solo in an Isle of Man GP race. Notes: Three wheeler with tray at rear, telescopic forks. The Maserati 160 / T4 is an Italmoto with a redesigned engine of 158cc capacity. A revised version was built in 1955, the 160 / T4 / TL.